According to Quesada, his grandparents founded Ramar Foods to give the generations to follow something they could build upon, and as Asian-Americans become a larger and more significant segment of the United States population, the company’s connection to Filipino culture and ongoing evolution becomes all the more important. “We take that very personally because there is an ongoing search for what it means to be Filipino in this country, and we think one of the answers can be found in our food,” Quesada says. Ramar Foods has grown in scope substantially since its inception, with manufacturing facilities throughout northern California and distribution centers in Los Angeles and Honolulu. 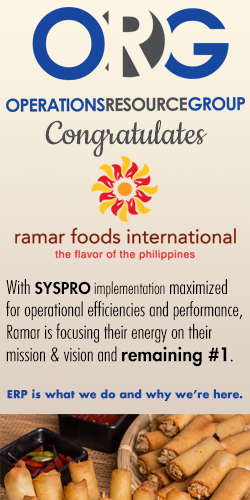 Although the company’s original focus was on Asian supermarkets and that continues to be the largest segment of its customer base today, Ramar Foods has expanded its scope to include customers in the foodservice industry as well as military commissary grocery stores. The company’s evolution has been gradual but consistent, and as the Asian-American demographic changes it has been working to follow that demographic into conventional supermarkets as well. “We’re learning as we go,” Quesada says. As the Asian-American demographic becomes more and more populated the second and third generations, Asian-Americans begin to drift away from shopping exclusively at Asian supermarkets, but that doesn’t mean they have abandoned the products and tastes they grew up with. “Their tastes are evolving in that they are adopting more of an American shopper’s value system,” Quesada says. At the same time, the Asian supermarket industry has undergone significant changes, as well. Once dominated by local mom-and-pop stores, the industry has undergone a lot of consolidation, resulting in chains that have the size and scope of traditional supermarkets in many cases but the same tight focus on Asian products. “We’ve gotten a bit of training on how to work with customers on that scale, and it’s made us a stronger company,” Quesada says. Setting itself apart in the Asian food sector means Ramar Foods stays true to the recipes and flavors that make Filipino food unique, even if that means putting itself at risk of being undercut on pricing. Although Quesada says that can be a challenge, Ramar Foods counts on the high quality of its products and its strong brand recognition to win over consumers. “One thing that everyone in this sector understands is that it’s very price-driven, very value-driven,” he says. Many of Ramar Foods’ competitors find ways to cut out or reduce the amount of more costly ingredients in their products, Quesada says the company refuses to cut corners. “If we’re making a meat sausage, it’s going to be a meat sausage, and if we’re making an ice cream, the main ingredient is going to be premium cream,” he says. This refusal to take shortcuts has served Ramar Foods well over the decades, and has resulted in the company’s many brands becoming some of the most popular in the segment. Among the company’s distinct and popular brands are Magnolia Ice Cream®, Orientex prepared meats and Pampanga’s Best sausages. “Our brands are very well-respected,” Quesada says. ORG has customers spanning a wide range of industries and business needs. We not only guide and implement off-the-shelf solutions for your business, we also program unique solutions that co-exist with your current ones. The result being an increase in reliability and efficiency in a way that fits your way-of-business.